1. 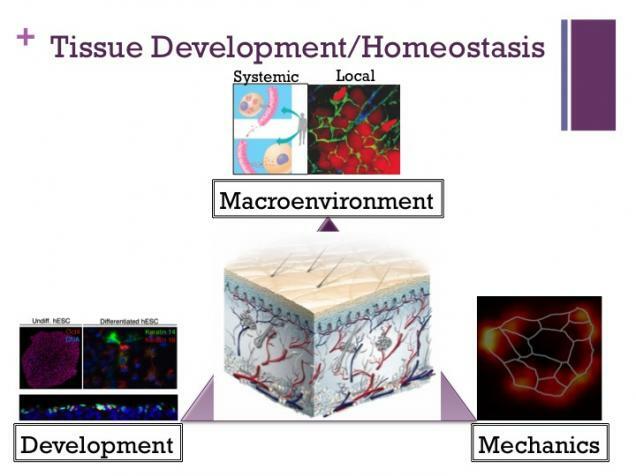 The role of the macroenvironment in epithelial tissue regeneration Within epithelial tissues, cells localize to specific niches, or microenvironments, that regulate their activity through cellular adhesion and signaling molecules. However, the identity and the cellular sources of many of these signals in epithelial tissues including the skin and mammary gland are unknown. Our work has revealed novel aspects regarding the source of adipocytes and immune cells as local signals (Festa et al., 2011; McGee et al., 2013; Schmidt and Horsley, 2013)and prolactin, a hormonal signal (Goldstein et al., 2014), that controls stem cell activity and skin regeneration. A major innovative aspect of our work has been the study of dermal adipocytes in the skin. 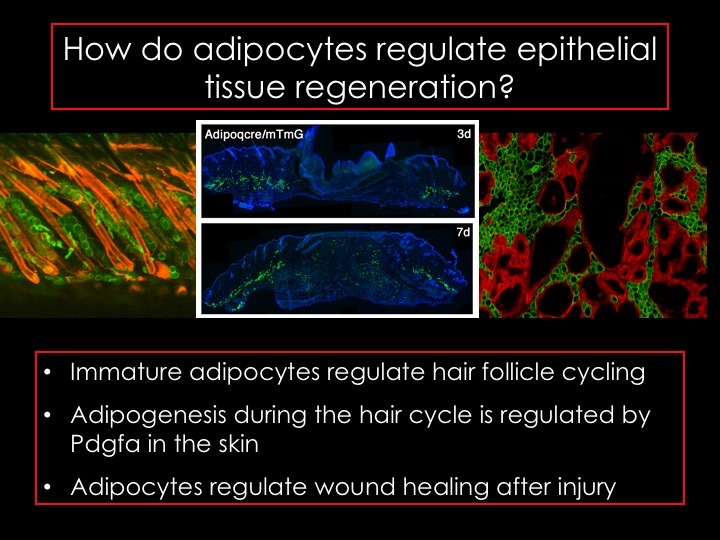 We pioneered the field of skin biology by revealing that adipocytes regenerate in the skin and are essential for regeneration of the hair follicle during its native regrowth cycle and following injury (Festa et al., 2011; Schmidt and Horsley, 2013). We (with M. Rodeheffer) identified mesenchymal adipose progenitors in the skin and showed that these cells are necessary and sufficient to induce hair follicle growth (Festa et al., 2011). We showed that these cells are activated after injury and required for fibroblast migration during wound healing (Schmidt and Horsley, 2013). Finally, we have revealed that dermal adipocyte precursor cell self-renewal is lost during aging and requires Pdgf signaling (Gonzalez et al., 2016). 2. Mechanical regulation of tissue homeostasis and development Mechanical forces are known to regulate the development, homeostasis and healing of multicellular tissues. 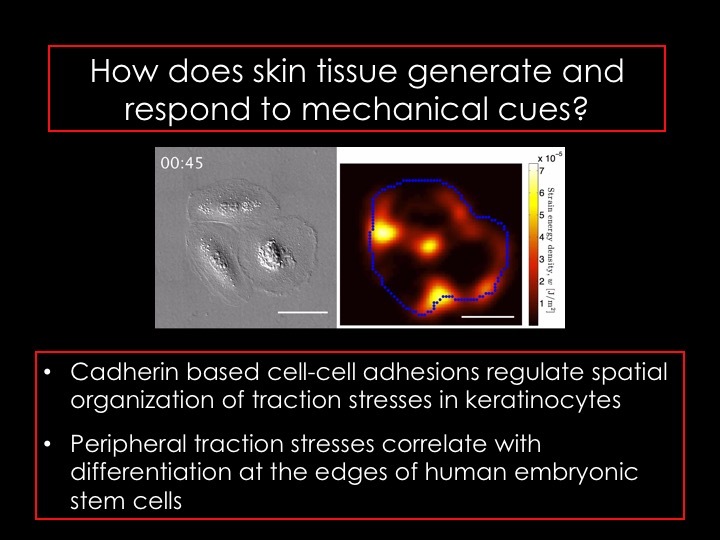 To probe the role of mechanics in skin function, we (with E. Dufresne) have defined the physical properties of epithelial cell clusters using traction force microscopy (Mertz et al., 2012; Mertz et al., 2013). Using genetics, function blocking antibodies and mathematical modeling, our work revealed the importance of physical cohesion through cadherin molecules in the coordination of mechanical force throughout multicellular clusters (Mertz et al., 2013)(Rosowski et al., 2015). We (with M. King) have identified a role for nuclear-cytoskeletal adhesion during the growth of the hair follicle. We find that inner nuclear membrane proteins of the Sun family are required for integrity of keratinocyte adhesion and hair follicle structure through regulation of the cytoskeleton (Stewart et al., 2015). 3. Keratinocyte specification During embryonic development, epidermal keratinocytes derive from a single layer of ectoderm cells. We used embryonic mouse embryos and human embryonic stem cells (hESCs) to identify novel mechanisms that regulate the transition from ectoderm to keratinocyte fate (Tadeu and Horsley, 2013). 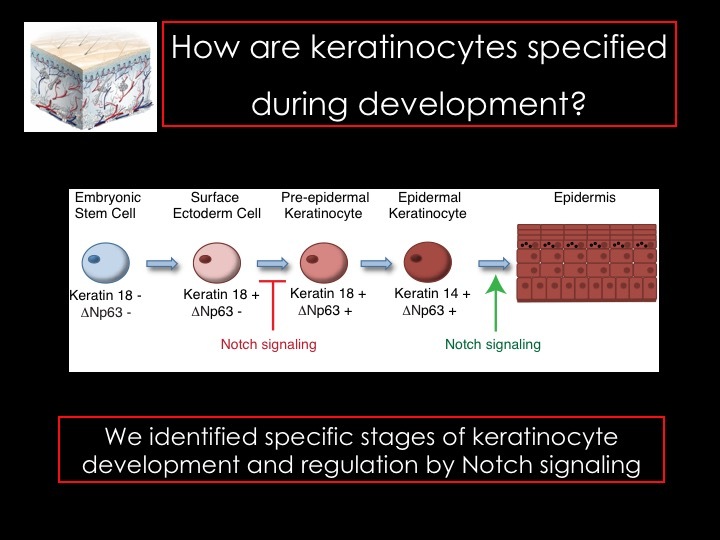 We identified two steps that lead to keratinocyte specification and showed that reduced Notch signaling was essential for the first step of keratinocyte specification (Tadeu et al., 2015).